Chefs throughout the world have long prized the rare and delicious creations of France’s Christine Ferber—an internationally known master patissière who has worked with culinary luminaries Alain Ducasse, the Troisgros family, and Antoine Westermann. 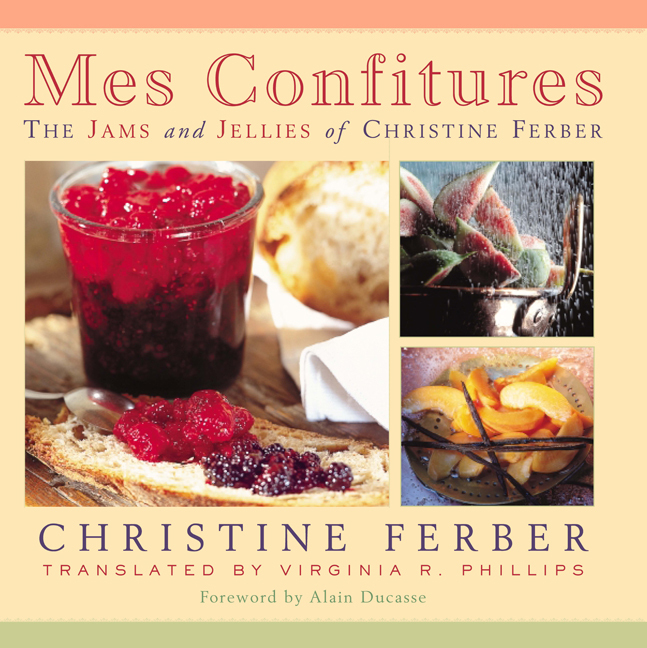 For the first time, English-language audiences have access to her artistry with the publication of the French bestseller, Mes Confitures: The Jams and Jellies of Christine Ferber. Written in a clear,accessible style, Mes Confitures brings hand-made jams to life for home cooks and professional chefs alike. In Mes Confitures, Ferber opens her personal recipe book, sharing such treasures as Black Cherry with Pinot Noir, Apricot and Spiced Apple, and Rosehip and Vanilla. Organized seasonally, uncommon recipes like Rhubarb with Acacia Honey and Rosemary, or Banana, Orange, and Chocolate jams raise the craft of confiture to a new level. Ferber also divulges her secrets, identifying the proper tools and equipment for foolproof, exciting, and unusual creations. Ferber’s use of locally grown, extraordinary ingredients, most of which are accessible in farmers’ markets, gourmet foodshops, or by mail-order, makes for exquisite jams that are far more interesting than the everyday. Ferber’s jams are artisanal in their reliance on seasonal fruits, traditional techniques, and their emphasis on simplicity and freshness. Christine Ferber lives in Alsace, where she continues to make jams, pastry, and confections by hand, with only the freshest local ingredients. She is the author of several books on French cookery.